All is not well within the corridors of power, sources close to the presidency have revealed to SecretReporters. This is caused by the Minister of Transport, Mr Rotimi Amaechi overbearing attitude on the board of the Niger Delta Development Commission (NDDC). We gathered that the announcement of new board members was a shock to the Secretary to the Federal Government (SGF), Mustapha Boss, who only read of the change on social media, without his input. According to our sources, the SGF has allegedly conspired with the Attorney General of the Federation, Mr Abubakar Malami to meet with the President to reverse the decision. 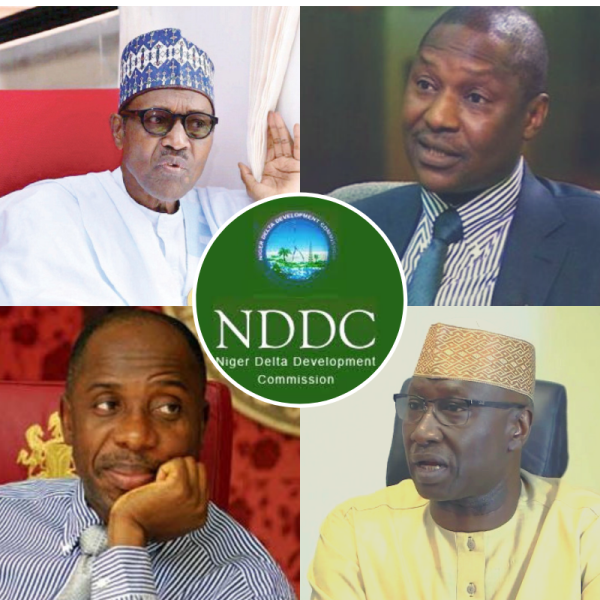 In plotting the takeover of the board, Amaechi made the President remove NDDC from the control of the SGF to the Ministry of Niger Delta Affairs. This act has turned the Presidential Villa to a silent warzone as the cabals are bent on making Buhari appoint an Akwa Ibomite to complete the four years tenure of the state and will be nominated by Obong Nsima Ekere, who resigned from the board as the Managing Director, to focus on his campaign of taking over Akwa Ibom State from the incumbent governor. To make valid the threat, the SGF has refused to issue appointment letters to the new board members, with backing from the cabal. Buhari we gathered is currently in a fix on how to reverse it and has asked for a legal backing that can nullify his earlier pronouncement. Like Amaechi stated in his leaked audio, Buhari may have signed the new board takeover without reading the contents.